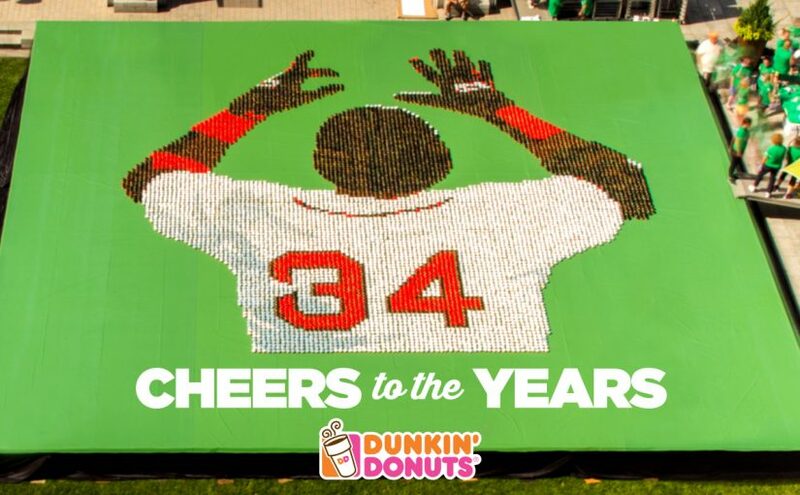 As legendary Boston Red Sox slugger David Ortiz readied for retirement in the fall of 2016, Dunkin’ Donuts’ Boston field marketing team turned to RF|Binder to thank “Big Papi” for his fabled career and role as brand spokesperson by helping to create and promote a mosaic of Ortiz made completely from donuts. In recognition of this project, last week Dunkin’ Donuts received a Silver Bell Ringer Award in the 2017 Bell Ringers Awards competition, honoring superior work completed by PR and communications professionals across New England. Dunkin’ Donuts sought to brew a big send-off for Big Papi and pay tribute to his outstanding career and contributions to the Boston community in true Dunkin’ fashion, in a way that was memorable, unique, and as legendary as the player himself. Dunkin’ Donuts is perceived as a fun, engaging brand with its coffee and donuts being an important part of daily life for many Bostonians. While David Ortiz’ retirement generated significant attention throughout 2016 — with multiple brands acknowledging via advertising and social content — there existed an opportunity for Dunkin’ Donuts to create a unique and unforgettable thank you to David Ortiz. It was determined that the element of surprise would maximize interest and attention, while leveraging the brand’s iconic donuts would help us stand apart from others’ initiatives to salute Big Papi. With the goals of creating an extraordinary tribute and driving authentic awareness throughout Boston and beyond, RF|Binder, Dunkin’ Donuts and its media and marketing partner, Brand Connections, collaborated to bake up the big and bold idea to honor Big Papi’s with a sweet celebration of the slugger’s career: a larger-than-life mosaic made entirely of donuts in honor of Boston’s larger-than-life hero. On a late September morning, more than 60 volunteers arrived bright and early at the Rose Kennedy Greenway in downtown Boston, bringing 10,000 of the brand’s signature donuts to create the mosaic. Made completely from the donuts, all painstakingly color-coded in frosting to match Red Sox team colors, the 40’x40’ mosaic featured Big Papi’s iconic pose after crossing home plate and lifting his arms to the sky in celebration. Using a “paint-by-numbers” process, the volunteers spent the morning carefully arranging the donuts to deliver a beautiful final result. Because the mosaic’s creation was a surprise and not revealed until after completion, the whole process and production was highlighted through Dunkin’ Boston’s social channels and filmed to become a time-lapse video for media and social placement. As part of this tribute, Dunkin’ Donuts donated 34 cents (in honor of David’s Ortiz’s number) from every donut used to create this unique work of art to The Greater Boston Food Bank. The $3,400 supported The Greater Boston Food Bank’s work within the local community. The “10,000 donut salute” accomplished its goals of generating positive PR and goodwill in Boston, with the activation driving tremendous coverage both within the market and nationwide. The story and time-lapse video was covered by more than 30 media outlets (primarily broadcast and digital) across both sports and general interest including the Boston Globe, Boston Magazine, NESN, FOX25, ESPN, Sports Illustrated, Yahoo! News and USA Today. The feedback was overwhelmingly positive, positioning Dunkin’ Donuts as making a unique connection to its brand essence, community ties and relationship to the hometown hero. David Ortiz himself even jumped in by thanking Dunkin’ in a tweet.